OK, it’s been a month since my first article. How have you done? Do you feel stronger? Do you have fewer aches and pains? Have you had more energy to carry you through a day on the lake? Or, have you been less-than-perfect with your nutrition and exercise? You know what you have done well this past month and what you need to work on. So let’s get refocused with the strength training part of your anglers’ conditioning program with a training session on the squat. The squat is a great exercise because it strengthens so many muscle groups. Muscle groups including the glutes, hamstrings, and quadriceps. Even the abdominals and lower back are worked. Also, your balance will be improved for days on those choppy waters. Just to review from last month’s article, you need to strengthen all major muscle groups with the following exercises: Squats, Pushups, Rows, and Crunches. Form is very important! And, we will cover the proper technique with each of the four exercises. These exercises should be done eight-12 repetitions per set with one-two set per exercise. If you have been consistent with you strength-conditioning program, you should add one more set this month. You should do this workout two-three days per week. You should not feel pain in your shoulders, knees, hips, ankles, back, elbows or anywhere is! If you do, then consult an exercise professional to make sure your technique is perfect. If you still feel pain after consulting an exercise professional, then see your doctor. Pain is not part of working out! Trust me, if you have not heard by now “no pain no gain” is a myth. I have been working out for 24 years. During that time I have had a few injuries. Luckily, I did not try to “work through” the pain, and therefore, the injuries have not manifested into chronic conditions. However, a little muscle soreness is appropriate. This is called delayed-onset muscle soreness or DOMS for short. You will typically experience this 24 to 72 hours after you work out. You will recover from DOMS much better if you have good nutrition and adequate hydration. And, believe it or not, light to moderate exercise will actually help you recover from DOMS. So don’t use DOMS to skip a workout; just turn down the intensity of your workout. In order to properly execute a squat, start with your feet approximately shoulder width apart. You should be looking straight ahead or slightly up during the entire exercise to avoid bad posture. Drop your hips back and down until your knees are at 90 degrees. Your weight should be distributed evenly throughout your feet or slightly on your heels. If your weight is on your toes, then the knees will come forward of your feet and put unnecessary stress on your knees. 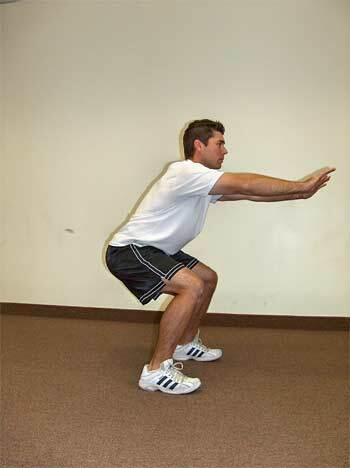 Also, your knees should not buckle in or out as your perform the squat. It is not necessary to add resistance until you have perfected this exercise. Remember anglers, be persistent to get consistent with your nutrition and exercise program. You will not only be in better health, but you will have the upper hand in fishing tournaments or any other outdoor activities that you may enjoy. And, remember: Always consult a physician or exercise professional before starting an exercise or nutritional program, learn how to correctly perform exercises to avoid injury and work into your exercise program slowly.